Alright, Peter Stastny, I'm sort of with you on this one. I'm not the biggest fan of giving up Chris Stewart and Kevin Shattenkirk, either. But I'm also having a hard time separating my subjective emotions and my objective opinion. Are you? The eldest Stastny was quoted (h/t to Dater for picking it up) as saying that the recent trade that allowed Colorado to acquire Erik Johnson and Jay McClement "destroyed the team." Despite the fact that I wasn't thrilled with the trade when it went down, it's clear that Erik Johnson is an upgrade over Kevin Shattenkirk on the blueline. The same age, both Johnson and Shattenkirk have their strengths, but Johnson is much, much more likely to become that shutdown, #1 defenseman that the Avs so desperately need. The trade, then, comes down to Chris Stewart. Will he be a 40-goal scorer in the NHL? will he be a dominant power forward who takes over games? Maybe. And if so, the Avs are going to regret giving him up. That is, if they can't replace him. One has to figure that the Avs will make it a priority in the offseason to a) acquire a #1 goaltender and b) replace Stewart. A quick look at the 2011 free agent class doesn't show many players who bring the combination of physical strength and goal scoring. If the season ended today, who would the Avs target? 20-goal scorer, Justin Williams from the Kings? Maybe a Brooks Laich-type player? Or maybe the Avs go after a restricted free agent such as Andrew Ladd, Devin Setoguchi, or dare I say, Zach Parise? Ok, so maybe none of these guys will be in Denver next season. But the Avs do and will have options to replace Stewart - whether through trades, free agency, or maybe even Ryan Stoa. 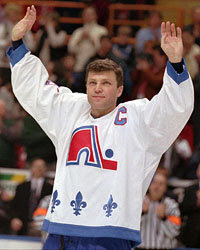 Let's also not forget, Mr. Stastny, that the Avs also got a #1 pick out of this. Whether or not this trade has set the Avalanche back 2-3 years will be determined by management's decisions in the offseason. Until then, we withhold judgement and root for the best.